13 | March | 2010 | Please Scoop Me! Formulae. 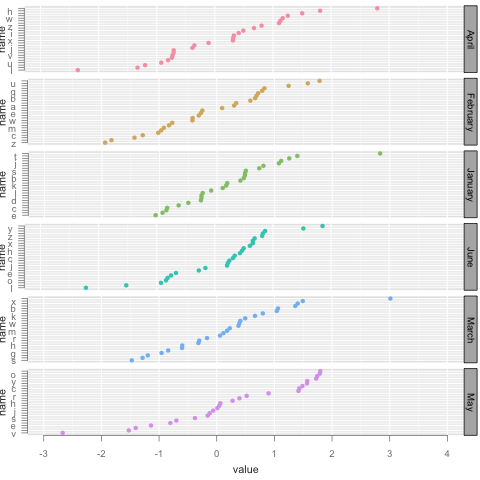 The old way of expressing the series of geoms and stats that form the plot was cumbersome. Putting a series of commands in the … leads to annoying issues such as poorer error handling. More importantly, because it can only express a series of statements, it becomes unclear which stats affect which geoms, making it impossible to express more complicated combinations. Reading from the right, this says to take iris$Sepal.Length, jitter it, bin the data, and bar plot the result. 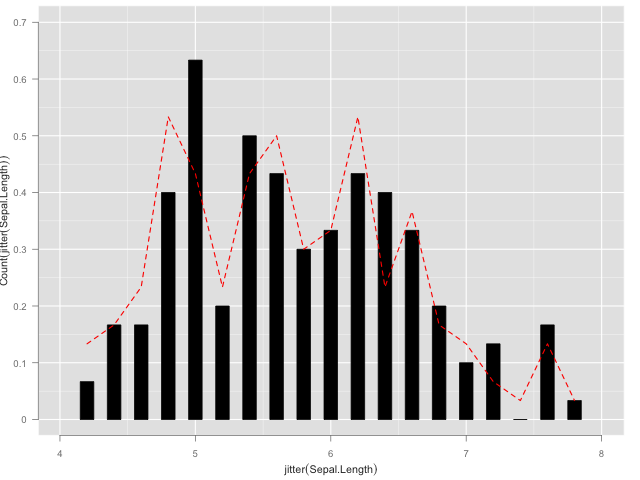 This is cool because it’s immediately clear that you’re stacking stats, plotting a histogram of the jittered data. The first term does the same thing, except that it does a hist() statistic without the jitter, and draws this as a red line. By using parentheses, you can also apply a stat to multiple stats/geoms. 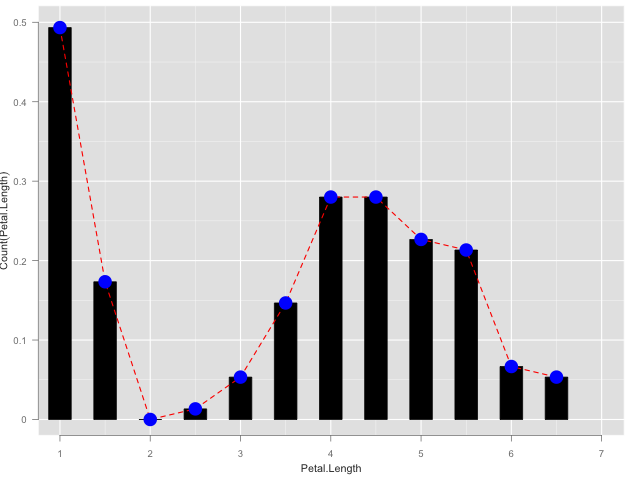 Here we’re just plotting a histogram but with some extra geoms on top for some extra flair. We think this notation is a simple and elegant way of expressing what interacts with what. The first two terms simply do a scatter plot. The next line does lm fits on each subset. Note that you have to be explicit with the grouping. With old semantics, you’d have an implicit group by on the facet variable, but because we aren’t combining the grouping and the faceting anymore, you have to spell it out. The first line shows you the effect of leaving out the grouping operator: you get a fit over all the data that appears on all panels. This is something I’ve always wanted to do and it seems to also be persistent question on stack overflow (e.g., “how do I draw a line at the facet/global mean on each facet panel?”). Hopefully this formulation makes it obvious. 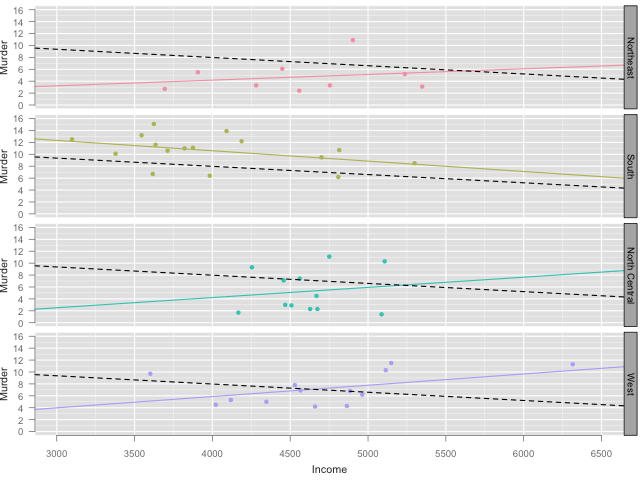 The first plot is the data unsorted. 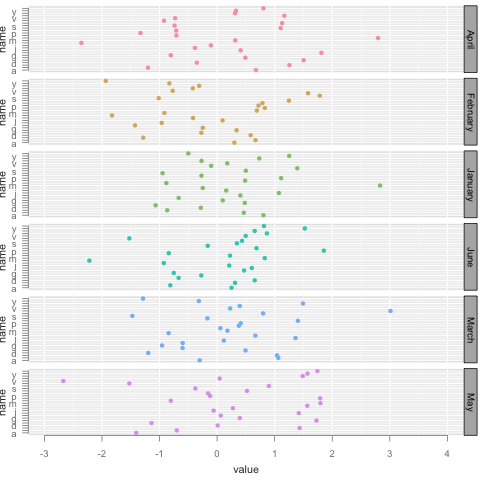 The second plot sorts according to the mean value associated with each factor across all facets (remember no grouping!). Like relevel, the sort statistic can take a function argument to specify how multiple points should be sorted. 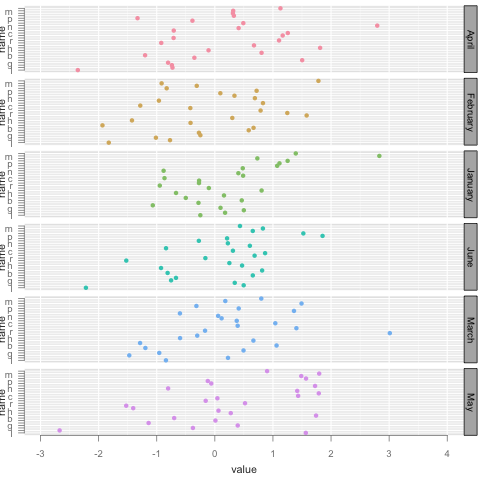 The last plot wraps the sort in a group by, meaning that each facet panel has its own sorting order. All of this awesomeness is available in the current svn repo. Check it out!